Kids naturally want what they haven’t earned, especially if we are handing it out for free. But what we have is an entire generation of young adults who got everything they ever wanted with little or no work; we have a cultural norm and it’s a problem. Because reality is, life doesn’t give us everything we want. We don’t always get the best jobs or a job at all. We don’t always have someone rescue us when we have a bad day or replace our boss just because we don’t like them. We can’t always have what we want when we want it. We aren’t always rewarded in life. Guilt: Often we give into our kid’s requests out of guilt. We need to stop feeling guilty for not giving our kids everything they want. It’s hard to swallow, but we foster the attitude of entitlement in our homes when we are ruled by a guilty conscience. It’s okay to ask kids to be responsible for what they lose and to require consequences for actions. 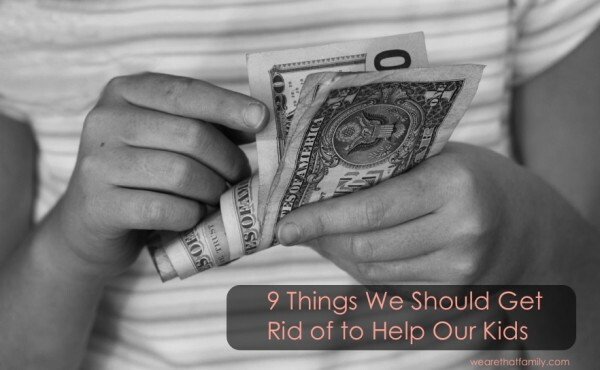 Overspending: I think it’s good for our kids to hear us say, “We can’t afford that” Or “We will have to save for it.” Because that’s real life. We don’t have All The Money to Buy All the Things. I’ve known families before who are working multiple jobs to keep kids in extracurricular activities, when honestly, the kids would probably be happier with more family time. Birthday Party Goody Bag (Mentality)-I’ve been guilty of this like most of us. But, really? We take our kids to parties so they can give a gift, but they take a small one home so they won’t feel bad? It’s not their birthday. This concept of spoiling kids (which usually goes far beyond goody bags) is temporary fun. It’s okay for them not to be the center of attention. Making our day-week-month, our world about our kids-Working in the non-profit world has redirected our extra time. We simply can’t center our lives around our children when we are centering our lives around Christ. Child-centered homes don’t help children in the long-run. The desire to make our children happy (all the time). If you visited my house, you’d find out pretty quickly that someone’s always unhappy. It’s not our job to keep our kids happy. Don’t carry that impossible burden. Typically when our kids are unhappy, it’s because we are standing our ground. And that makes for much healthier kids in the future. Made Up Awards: You know what I’m talking about. Rewarding everyone who participates in every area only fosters an inflated self esteem. Kids don’t need rewards for every little thing. It’s okay to lose, they learn through failure as much as success. Fixing all their problems: I don’t like to see my kids struggling. There’s a part of every parent that longs to make things right in their child’s world. But it’s not healthy to create a false reality. You won’t always be there to do so and not only that, if you’re doing it all for your child, why would they need to learn to do it themselves? Fixing all their problems is really only creating more challenges in the future. Stuff: We could all probably fill a half dozen trash bags with just stuff. Excess. Try it. Bag it up and get your kids to help you and give it to someone who needs it. Unrealistic Expectations: My girls are always asking for manicures. I didn’t have one until I was married, pregnant and 27 years old. I’m not opposed to the occasional treat, but it’s the attitude of expecting it because you as a parent or others have it. Just because I have an iPhone, doesn’t mean my children will get one. We don’t have to give our kids everything we have. It is okay to make them wait for things in life. It’s okay to toss these things out.